I’ve been blessed with having great skin most of my life, but since we can’t have it all, I have terrible dark circles under my eyes 😫 Actually if it weren’t for the circles, I would skip foundation all together. But since there’s always a solution to every problem, concealer to the rescue! I’ve tried many concealers over the years, and I like liquids more than other forms. Liquids tend to not settle in the lines under my eyes or look cakey, so yay! I’ve also found that the secret is using a good brush! Eco tools makes great brushes and for cheap! The new one I’m using now was only about $5 at Ulta and I have to say, it’s the best one I’ve ever had. It’s even better than the one I spent probably 3 times more for at the MAC counter! 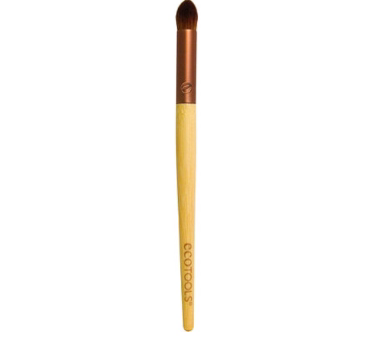 It’s called the bamboo deluxe concealer brush. I’m telling you, you’ll love it if you try it! Do you have a fav concealer brush? And if you’ve tried this one, let me know what you think!